I’ve worked with companies of all sizes throughout my career, everything from big established corporations to bustling startups. The one thing all these companies had in common was the struggle to manage projects and teams efficiently. Because of this I’ve had the opportunity to work with a lot of project management tools, everything from the big and expensive to the free and simple. I recently had the opportunity to try Nuvro and can honestly say I’ve never come across anything as robust, yet surprisingly easy. 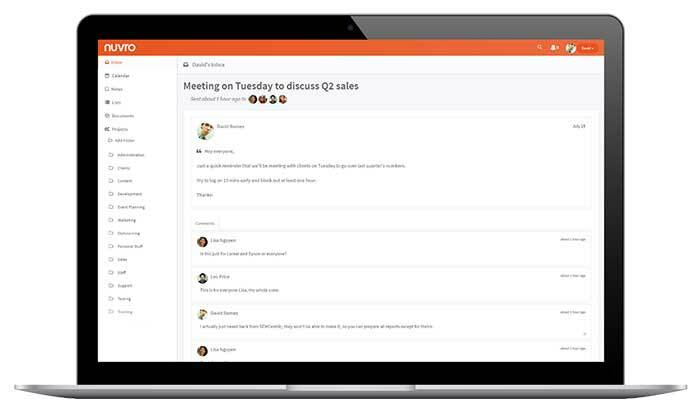 It’s almost like an enterprise platform that’s as easy to use as Todoist or Asana. It’s become my primary project management system for several reasons. Whether you’re a freelancer or a consultant or you manage a team of any size, Nuvro is the tool for you. Here’s why. Nuvro goes beyond what most other PM tools offer. 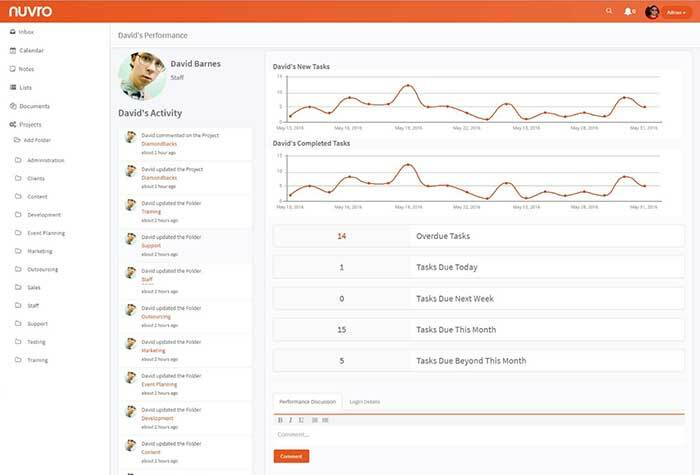 The current ones feature project management, task management and team collaboration. They all help with organizing, assigning and monitoring. The problem with finding the right project management tool to use is that you’re often stuck comparing very similar products. I believe Nuvro recognized this and engineered a genuinely useful product that offers all of these expected features plus more, making Nuvro a real game changer. I’m not going to write about everything Nuvro can do because like most software, there are always more features than any one person needs. Instead, I’m going to write about the few things that really make Nuvro stand out to me and my team. When you first log into Nuvro you’ll see that everything is organized into 3 vertical panels – Your projects on the left, tasks in the middle and task details on the right. Projects are organized into folders which can be collapsed to keep everything clean. Your task list is neat, only showing the most important details about each. The task details panel is powerful and is where all your work gets done. At first, I thought the task details panel was too basic and that it lacked features common in other project management tools. But upon creating my first few tasks it became clear that it’s not basic; it’s very well organized. Everything you really need is front and center, while everything else is tucked away for when you need it. One example is the activity feed. Every other PM tool I’ve used shows the activity feed just as prominently as far more important task details. In Nuvro, the activity feed is organized into a tab next to your task comments, available when you need it and out of sight when you don’t. It might seem like a small detail but it’s exactly why Nuvro is so clean and fast; this level of attention to detail really sets it apart. Plus, when you do need to see the activity feed, it’s larger and cleaner and easier to analyze than expected because of the extra screen space available. Once you use Nuvro for a few days, you’ll notice how this subtle attention to detail is seen throughout. You’ll feel the benefit of this by how easy it is to work with. Nuvro helps you get more work done by eliminating all clutter and friction from the work management process. 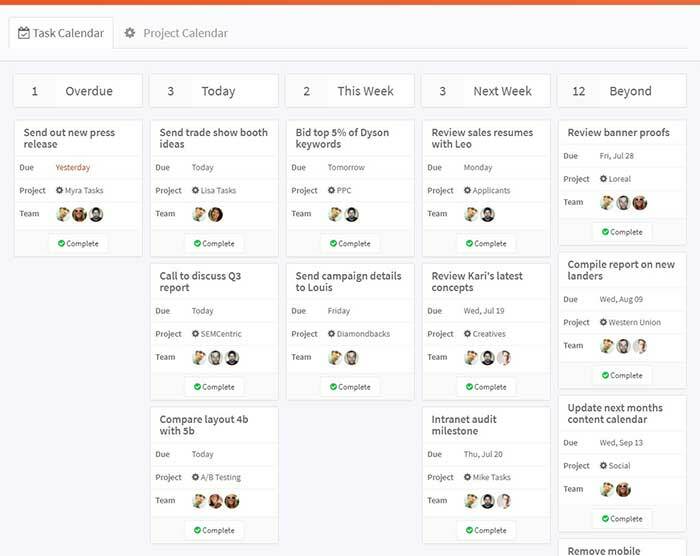 Nuvro gives you two project calendar views to help you stay on top of all scheduled projects and tasks. When you first log in, you’ll see your task calendar. It’s organized to show all of your current tasks, overdue tasks, tasks due this week, next week and beyond. The project calendar is organized in the same way. These workload dashboards are so useful and simple that I’m not sure why more project management tools don’t have them. In one glance, you can see exactly what you have to do that day, what you’re behind on and what your future workload will be. This makes it easy to proactively adjust your schedule to make sure you continue to work as efficiently as possible. And for managers, it’s even better because you can access the workload calendars of all your staff. You can quickly visualize the workload of anyone at any time. Almost everyone seems to have a love/hate relationship with email. It’s necessary, but messy; efficient, but prone to error. Some of your email you need, most you don’t, and they’re all mixed together. Nuvro solves this problem by providing an internal email system that allows you to communicate clearly with everyone in your company, without the risk of spam filters, deliverability or lack of accountability. Everyone in your company can use Nuvro to email each other and you can keep your inbox clear for clients, support and other important things. The team management dashboard is what really grabbed my attention and prompted me to try Nuvro in the first place. Every similar tool offers Project Management, but Nuvro also offers Team Management. On one single page, you can see the progress over time for your entire team. You can see how many tasks everyone is working on, how many they’re overdue on and how many they have coming up. You can easily recognize future productivity issues and correct them before they happen. You also get a performance review page for every staff member which offers more detail into their performance over time. You can look back months to see how their recent performance compares to previous months, and you can predict their future performance by comparing their track record with their upcoming tasks. And you can even discuss their performance with other managers, in private. Running a business is messy. There are always lots of notes, documents and random tasks to stay on top of. Nuvro helps keep everything organized, literally everything. You can organize your tasks within projects and projects within folders (which you can use for clients, campaigns, departments or even separate companies). You can organize all of your documents by category, share them with anyone who might need them and you can even have running conversations about documents (very useful when collaborating on sales copy, contracts or even marketing creatives). You can keep your random tasks organized in a to-do list, separate from everything else. This is perfect for tasks that don’t need to be scheduled, don’t belong to any particular project and don’t need to be shared with anyone. This makes them perfect for both business and personal use. You can organize all of your notes in any way you like. Nuvro’s online notes work just like Evernote; only they’re built into Nuvro and readily accessible at any time without having to log into extra sites or apps. Notes can be shared with team members or kept private, for business or personal use. And like everything else in Nuvro, they work perfectly on all mobile devices. Nuvro’s built-in document manager is another feature that makes it worth trying. Unlike other tools that offer document management, Nuvro didn’t try to reinvent the wheel. 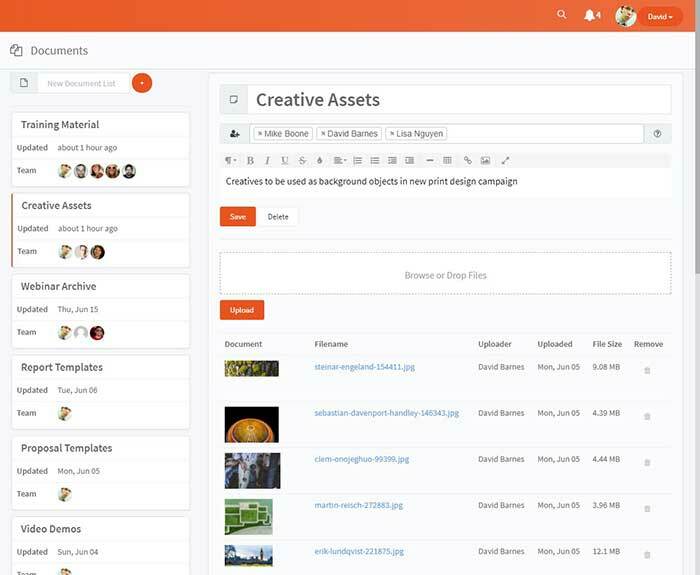 Instead, they made a tool that helps you organize, share and collaborate on all documents important to your business. • Training material for new staff members – I created a training category and automatically shared it will all new hires. They go through the training material and comment with any questions or concerns. We can then discuss all relevant details as needed, in one centralized place. • Banners and other design files – I uploaded all logos, banners and other creatives and shared them with the entire design team. We can now grab things from one place, no more uncertainty if the files are the most recent or not and no more forwarding large email attachments. 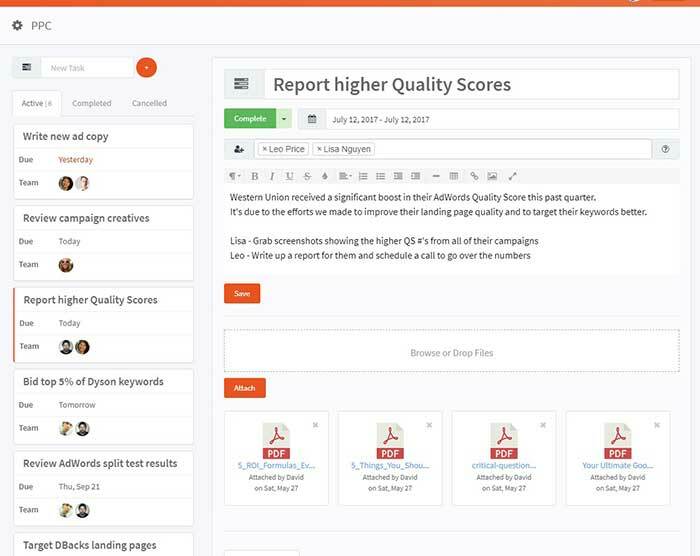 • Report and Proposal templates – Perfect for making sure the sales team always has the latest versions available at any time. And questions can be resolved quickly and within the context of individual reports, spreadsheets or contracts. Nuvro was clearly made specifically for people who spend most of their working hours doing online work. Nuvro saves you time and mental energy by giving you everything you need to manage online work, all in one platform. Projects, online notes, document sharing, quick to-do’s, messaging – it’s all there. Once I got going with Nuvro, I stopped using 5 or 6 other apps. I generally find it difficult to choose new software and tend to only try new solutions when it’s really important. But with Nuvro, I was surprised at how easy it was to get my projects in, I was off and working within maybe 10 minutes. I believe it’s because of how simple it is to use, there’s no learning curve, no new ways to think about your workflow or organization. It’s very straightforward, very fast and light. One thing I always do when trying new project management tools is compare it with my existing tools, after I’ve had a week or two to work with it. I take a couple of days to return to working with my old pm tool and see how it feels. When I did this with Nuvro, the benefits of Nuvro over my old software were clear. I actually found it tedious and slow working with my old one; went back to Nuvro, and I was up and running immediately. This to me was a big deal and is why Nuvro is my new favorite tool for managing my projects and my team.